Who would have thought a trip to defending MLS Cup champs Atlanta United and raucous Mercedes Benz Stadium — without superstar signing Marco Fabian, no less — was the remedy to Philadelphia Union’s slow start in 2019? The Union were impressive on Sunday night — even with just 29% of possession — and should have conceivably won had it not been for yips in front of goal throwing the team off yet again. But a 1-1 result in Atlanta, no matter the opposition’s struggles under new manager Frank de Boer, should absolutely be lauded. Cory Burke does a really excellent job of pressing Michael Parkhurst to force the ball wide. Once it’s wide, there’s nowhere to go and it’s recycled back to Parkhurst. Fafa Picault and Burke then squeeze Parkhurst while Brenden Aaronson cuts off the middle outlet to Jeff Laurentowicz. Parkhurst is forced to play the ball deep, where it is easily intercepted by the Union. A similar defensive movement happens below. The Union force the ball wide — this time thanks to Alejandro Bedoya quickly bodying up his man — where Burke and Aaronson execute a nice little trap. The ball spills out of bounds and the Union shut down another possession. Creavalle should have buried that, yes, but there is SO MUCH to love in that play. 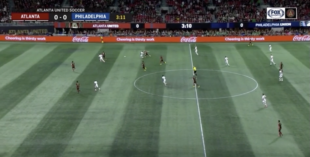 1) The youngster’s terrific run through the channel probably made ATL fans miss the heck out of departed playmaker Miguel Almiron; 2) The composure to turn very-good-defender Leandro Gonzalez Pirez around; 3) The vision and skill to find Creavalle alone on the other side of the 18. More of that, please. And then this through ball to Fafa was just adjkhadkjasdjan (sorry that was my jaw on the keyboard). Again, it should have been finished, but Fafa will find his finishing boots in 2019 and it looks like new addition Jamiro Monteiro has a little more composure in the box than Creavalle. So those late runs by Alejandro Bedoya, Monteiro, or whoever is playing the shuttler role in the diamond, can really be a weapon. What impressed most about Aaronson’s debut was his work rate and defensive positioning. The kid effectively took Atlanta skipper Jeff Laurentowicz completely out of the game at the top of the diamond. His intelligent pressing (see clips above) often forced Atlanta’s backline to push the ball wide or long with little danger. It was a complete performance and Aaronson absolutely deserves more minutes — and soon. I expect Marco Fabian to return to the lineup next week and I would not hate it if the youngster found himself adjacent to Bedoya in the shuttler roll. He certainly appears to have the defensive acumen for it. Or if the Union rolled out a 4-2-2-2 with Aaronson and Fabian side-by-side as dueling No. 10’s. The Union continued to concede a lot of possession late in the game, which is fine with the game plan. A 1-0 victory against a team like Atlanta on the road — just with the talent on the field, no matter de Boer’s weirdo system — means you need to be focused for 90 minutes. On Sunday, once again, the Union were not, and an innocuous ball into the box came back to bite the Union. I don’t mind giving up a goal in Atlanta so those missed chances are what the Union should really rue. That said, people are going to talk about the fact that it was Haris Medunjanin again who was closest to Barco and just stood pat. I was going to try to absolve him here and say it was team defending that let Philly down. But I’ve watched the clip about 20 times. and while Bedoya passed Barco off to no one in particular, Medunjanin sees the ball come in and literally stops himself from making a play. I get thinking that someone else might make that play, but you have to at least go for that ball and try to throw the guy off. Watch the full clip below. You’ll see that the Union actually handle some beautiful ball movement by Atlanta really well. They find their shape smoothly enough. And while Julian Gressel probably has a little too much space to operate (and plays a very nice ball, by the way), there’s no reason you give a 5’6″ midfielder that sort of room with six defenders in the box. I’ll add this about Medunjanin: He simply doesn’t look comfortable in the Union’s new system. It’s not his fault he’s being asked to do some work he’s never had to do before, but if he wants to keep seeing the field, he needs to make those plays. He was certainly better on defense Sunday than games past, but that one error cost the Union two points. Kai Wagner is good, you guys. Really, really good. Ernst Tanner may have actually found himself some overlooked European talent. Teams are happy to give Ray Gaddis a lot (a lot) of space on the ball (with good reason); on Sunday, he did a bit better taking advantage of it. Derrick Jones again had some valuable minutes in this game. He didn’t exactly stand out, but he held his own and looks like a solid MLS 6 or 8, which I think is probably what fans should reset their expectations for. The Union were not perfect on Sunday. But they played more of their game and looked to be finding some real comfort in the team’s new playing style. Next week, they’ll hope to build off the performance against a very solid, very well-organized Columbus Crew team under Caleb Porter. I was completely impressed with Aaronson. He not only made some nice line cutting passes, but he was very defensively sound. He tracked his man, kept good shape, cut off angles. It was truly impressive to watch. More please. We all know the kids will make mistakes. So do they. They have to play to learn. So, play them. Harris is 30 something and has played three straight for 90 mins. Time to rotate to keep Harris fresh and give others opportunities. For Saturday, I would love to see Jones as the six, Bedoya and Aaronson playing box to box and Fabian on top. Jones doesn’t need the offensive ability Harris provides when you have 3 others that can carry the load going forward. I agree with all of this except that Medunjanin needs to be rested because of age. I mean he’s played 3 games in 3 weeks. That’s not a tall order. Dude is only 34, you don’t lose endurance that bad. But he should still sit because as you said we have better options. I think Haris needs to sit because he is what he is at this point in his career. He is not a ball winner. To me, that’s what you want from his position. Like I get he can make great passes and has vision. I just think the team would benefit more from Jones/Creavalle winning balls higher up the pitch and putting pressure on earlier. Good for Jones on being called up, but that stinks for the team. I have to say, Kai Wagner has been the biggest positive surprise this season so far. The dude can ball and he is “the machine”. If Real thought he was the anointed left back at the start of the season, Wagner had other ideas. I have no intent to criticize JBH’s comments about Wagner and Real. None. I intend to supplement his observations. WE do not know how familiar Kai Wagner already was with the general idea of Ernst Tanner’s system before he arrived. We know that Matt Real was not at all familiar with it, since neither Thom Schauerman (sp?) at Shipley nor the Union’s Academy played it. I have watched two Bethlehem practices at both of which Real was a participant. Official coaches Burke and Hogan, and unofficial coach Chambers have been helping him learn it. He seemed to play it more effectively against North Carolina than Birmingham the week before. Recall that in his first year as a pro with Bethlehem, Charlie Reymann was better than he at the beginning of the season. I initially chalked him down as a long-term development project. By the middle of the season Matt won the job, kept it, and was signed by the Union the following offseason. I fully suspect they are playing a similar long game with Real and Wagner. Wagner has been very good. But wait until Real is ready to compete on equal terms before making judgments. The proof is in the starting XI. I agree Real is the long term project, and suspect Wagner will be sold back to Europe at a profit in a couple of years. I also think this is a good development for a player like Real since Wagner will push him to compete for the spot. I’m not sure what this season will hold for Gaddis going forward, but during the second half of last season he was making a lot of forays into the offensive third. He had some shots, a few crosses, and was plain active on offense. We’re judging on a curve when it comes to Ray, but if can find that same aggression that he had for stretches last year, I think he’ll be just fine for us. Take away everyone’s discontentment about him for a minute and think of him as “Player X.” Stripping emotion and expectations from an evaluation, you’ll likely come up with the idea that he is acceptable at the position, particularly if he can maintain something of an offensive focus. No, he’s not an All-Star, but he’ll do until we can find an upgrade. As for Aaronson, let’s give it a couple of games. That was a damn fine performance that showed potential, but it needs to be consistent and repeatable. There’s no reason to doubt him now, but I’m going to look for some repeat performances after teams get some film of him. I want to see Mbaizo fail before I’m willing to settle for peak mediocrity in the RB position. +1. I haven’t seen Mbazio much but every time I have he looks great. Gaddis is what he is at this point. I mean yes he is a hard worker and may get marginally better but he’s never going to scare anyone attacking and that compresses the attack even more. The configuration of the two schedules, i.e., Union Saturday Steel Sunday, this weekend mean that Mbaizo might get much needed game minutes with Bethlehem. Just guessing, no inside knowledge of course. I am mad we got rid of Rosenberry. But this hasn’t been the same Gaddis we all know and love. I’d argue that he’s actually been doing well for himself out there. He’s impressed me so far – and I wasn’t looking forward to seeing him start this season. He seems to be adapting better than most out there.